This year a cheerful group of between 40 and 50 physiotherapy students took part in Relay for Life 2019 raising awareness and gathering funds for the Cancer Society. 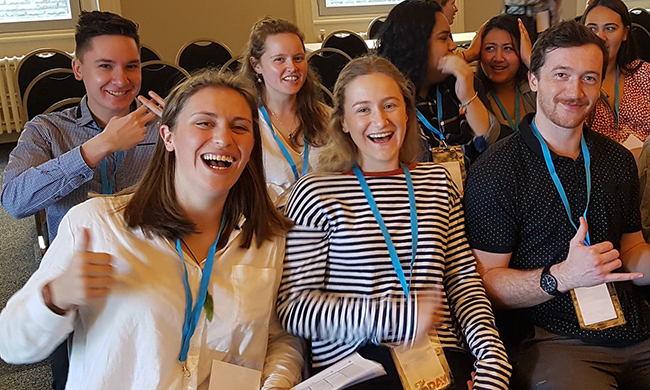 "The yearly Otago University Student’s Association event kicked off at 6pm on Saturday 30th March in Dunedin and finished the following morning at 6am. Students arrived wrapped in their Physiotherapy Students Association tops complimented this year by the extra addition of ‘something blue’ which was our team theme. They walked or jogged the course for either a few hours at a time between breaks or for the entire 12 hours. Live music, competitions and food stalls entertained the crowd. Physio students offered leg massages to runners and walkers in exchange for a donation to the Cancer Society. The group earned high praise for their hard work. When darkness fell, a beautiful candlelit vigil took place to remember loved ones lost to cancer, and to celebrate cancer survivors and carers. In the lead-up to the event, team members had worked hard to encourage friends and family to donate so it was exciting to learn that the physio team had raised more than $5000.00, the largest sum raised by any team on the day. Ngā Raukura O Tāne Whakapiripiri (MPSA) at Otago supports 2nd, 3rd and 4th-year students to strive, collaborate, learn and accept opportunities which become available each academic year. The Student Executive team organised and operated social events, formal evenings, sports and volunteering days for our physiotherapy students. On September 7, 2018, the School helped celebrate World Physiotherapy Day. This annual international event generates awareness of the contribution that physiotherapists make to society and the positive difference made in the everyday lives of patients and their families. A group of second and third year Otago students marked the day by volunteering to offer therapeutic massage (for a small fee) to those in our community. The $520 raised went to ParaFed Otago which offers sporting opportunities to those with physical disabilities. The Physiotherapy Students Association thanks all staff and students for such a great effort. Otago physiotherapy undergraduate student Bridget Rollinson grew up in the small South Canterbury farming town of Waimate. Earlier this year she joined a “UN Youth US Leadership Tour” to the United States travelling to San Francisco, Washington D.C., New York City, Boston and Honolulu. She was also one of a group of 13 tertiary students who competed at the Harvard National Model United Nations (HNMUN). They were to meet each day with a variety of NGO’s, governmental organizations, diplomats and interest groups. Meetings in each city shared similar themes. In San Francisco, they met with representatives of Google, Facebook, Uber and New Zealand Trade and Enterprise. In Washington D.C they toured the Library of Congress, Capitol Hill and NASA headquarters and met with state officials. In New York City, home to UN headquarters, Bridget spent a little time with third in command of the UN (and a Kiwi) Jan Beagle. Then it was time for the team to polish their debating skills and knowledge of foreign affairs in preparation for HNMUN in Boston. Model United Nations events take place at both secondary and tertiary levels, and involve student teams acting as an ‘other’ country, to research and represent their case in a mock UN format. Each team also engages in role plays which involve a specific UN committee and special policy area. They aim to represent the position of a delegated country in this domain. For HNMUN, Bridget joined the Committee for the Commission of the Status of Women. She relished hearing strong articulate women's voices advocating for women’s rights in all nations. Bridget says that while the trip gave her an incredible opportunity for many kinds of learning, two memories stand out. She felt outside of her comfort zone in the company of students of law and politics, and yet when it came to working in a team, Bridget's knowledge and experiences of physiotherapy meant that she was able to offer a unique perspective. She also gained insights from hearing first-hand about some of the difficulties faced by a group of Venezuelan students and their experiences of an education system under financial pressure. It gave Bridget a fuller appreciation of the opportunities, relative accessibility and quality of education in her home country New Zealand. On the 17th March over 40 Physiotherapy students took part in the annual Relay for Life at the Caledonian Grounds in Dunedin. "For 24 hours our students walked around the track for one sole reason: to help fund cancer care. We got together to show our support for both those who have been affected by cancer and those who are currently battling the disease. It was amazing to see the determination and courage shown by all our student’s, however two of our team - Simon Morbey and Riley Henley walked for the entire 24 hours with almost no breaks. which means that (alongside some others), they completed the equivalent distance of more than 2 whole Marathons. It was a big challenge but nothing compared to the challenges that cancer patients and their families face each day. Our team raised over $5,200 for the Cancer Society which made all of us quite proud. It was a fantastic weekend's work for very good cause!" Early each year, third year physiotherapy students stage an orientation camp, helping slightly newer physios have some fun and get to know each other. "On Thursday, the 15th February our annual orientation camp was held at the local Brighton Rugby Club just south of Dunedin City. About 85 second-year students attended the camp, alongside 24 eager and excited third years. As third-year students we all loved our own camp, so we wanted to make it just as enjoyable for all the new aspiring Physiotherapists. They were shy and quiet at first, as expected when chucked into a sea of 80 other unfamiliar faces. Nevertheless, that is why we believe camp is such an important time for these students. It gives them an opportunity to get to know each other before walking into that overwhelming first 8 am lecture. Our camp was jam-packed with all sorts of activities. The second years were split into groups all led by 2 third year leaders. The leaders decided on a costume that the second years had to wear for the entirety of the camp- or so they thought! Some of these costumes were hilarious. In these teams, they competed against each other in a quiz, sports, some outrageous relays, speed dating, and made sand castles that proved to show a lot of teamwork! It was brilliant to see them come out of their shells. Their confidence flourished in one of the favourite activities - the skits. The skits are usually based on embarrassing stories from the third years which is always a crowd pleaser and this year was no exception. As the second day came along the shyness began to disappear and our second years were getting on like a house on fire. The group varied tremendously. Some had already completed a degree, some were international students, and the majority were straight out of first-year health science. Health Science is a tough course and so is Physiotherapy, but there is a completely different atmosphere. There is no competitive factor involved, instead, everyone wants to help each other. You spend so much time with everyone in your labs and lectures that you start to realise very early on that Physiotherapy is really just one big family. Within the first few weeks, you are already starting to work with patients and it doesn’t take long to realise how much of a privilege it is to be in the Physiotherapy program. Camp is a fantastic event, but I believe it only gets better from here so good luck to you all and welcome to the Physiotherapy family!"